My expectations were high. I was sure that the man with the red horn and his unit would fill the hall with their energy soon after they took place on stage. However, frankly, it was not on my mind that they caught the tension of the audience this much successfully and could stay on stage this much long although they have another concert for the following day in Tblisi. This is between you and me, I have said to Nils “It is in my dreams to listen the solo performance for Ack Du Warmland Du Skona in the album 1997 Live in Montreux at least once in my lifetime lively from you” some time before the concert. The tension in the concert were so high that I thought that he could not manage to insert this silent solo performance into the playlist. Fortunately, I was wrong again. After the encore, as the last performance, he performed it for me and rest of the audience and took a memorable place in my heart. The interest of the audience in the musicians were intensive also after the concert. I am not sure but I suppose many CDs are sold last night. Nils Landgren has signed his autograhps for a long time. 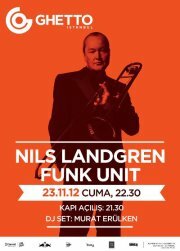 I have told Nils Landgren that I really would like to help for a concert in Ankara to be organized and I would do my best for this. We have talked about the following Christmas with My Friends concerts in Germany. As a last word before saying bye to the musicians I said “Do not be surprised if you see me among the audience in Germany Nils” and he answered me “It may be, I believe, because you are crazy”. As a summary, November 23rd night was an incredible night that is full of good musicians. I hope the audience in İstanbul and the band think so and we can listen to them soon again.